In the spring of 1982 I had been commissioned to write a book about Bruce Lee and his method of jeet kune do by a martial arts magazine publisher. When I met Joe in March of 1982 he was 38. Joe had won the world full-contact championships in 1974 and was now intent on regaining his PKA title. I was intent on learning the Joe Lewis-Style™ but he didn’t give lessons. Joe understood fully that I was interested in learning exactly what Bruce Lee had taught him and how he had made it work in the street and in the ring. To learn from Joe you became his sparring partner. So for the next few years I would travel monthly to Raleigh, NC or any number of other locations to “spar.” At least once per month Joe would stay at my home in Christiansburg, VA for a few days at a time. Once here we would create articles, organize seminar tours and spar. After leaving Hollywood for good, Joe needed an income. 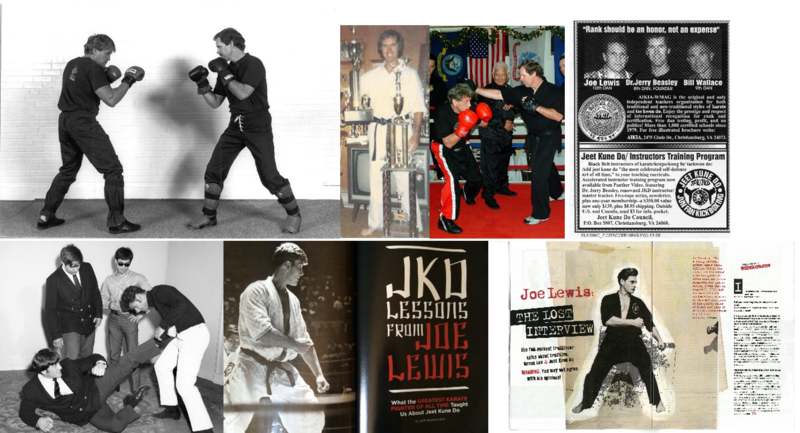 So to begin a seminar circuit Joe and I decided on the name “Joe Lewis American Karate Systems” in 1983. We called it “American Karate” to identify the full-contact Joe Lewis-Style™ fighting only version from the more traditional forms of Karate. And, because Bruce Lee’s fighting system was also referred to by some as “non-classical karate.” To earn rank you had to fight 3 rounds full contact Joe Lewis-Style ™. Joe and I also started an organization we called the American Independent Karate/Kickboxing Instructors Association™ or Aikia.net for short to certify more traditional styles including student and Black Belt ranks. Together Joe and I worked closely as partners in seminars, camps, writing and promotions for the next 20+ years. In the early 90’s Joe and I had decided to write a book to be titled Joe Lewis-Style™ Self-Defense. We took photos and designated book chapters. In 1997 I was selected by Panther Productions to star in the jeet kune do video series focusing on the Joe Lewis-Style™ of JKD. That same year Paladin Press requested a book manuscript so Joe and I decided on the title “The Greatest Karate Fighter of All Time”. Instead of using the original Joe Lewis-Style™ as the title we went with Joe Lewis American Karate Systems.